Drawing inspiration from the bounty of the Okanagan Valley, Sarazen's Restaurant and The Player's Lounge and Grille at The Okanagan Golf Club offer an impressive array of menu choices featuring local ingredients prepared with West Coast flair. After a day on the links, relax and let our servers pamper you. In fine weather, dine al fresco on our patio and soak up the scenery. Pair your meal with a selection from our list of Okanagan wines to fully savour the delights of the region. 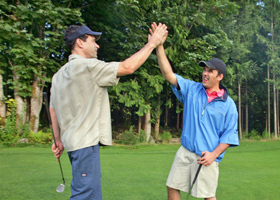 Open during the Golf Season, April through October, or for special events during the winter Holiday season. Open and close times are subject to change, and vary with daylight/golfing hours.